The photo below shows how you can present the 7-CONNECT option in the payment method of your website. Use the text “Pay at any 7-Eleven store” or “Pay at 7-Eleven” to describe the 7-Connect payment option. 7-Connect Reference Request: You will need to request for a 7-CONNECT Reference which will be used by customers to pay at the store. Merchant Payment API: This URL will enable the 7-Eleven store to notify your system in realtime whenever the customer pays at the store. You may use the following graphics to communicate to buyers that you accept 7-CONNECT. These are logos designed for use on your home page and in your checkout page. 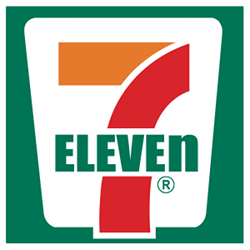 Using the 7-Eleven logo will allow your customers to easily recognize that payment can be made at any 7-Eleven store. The following logos are not recommended for use but will remain here as an archive.